Presenting the items on behalf of the University management, Mr. Augustus Brew of the Institute of Distance and e-Learning (IDeL) said that farmers play enormous role towards the nation’s growth. “Farmers are worthy of recognition; they feed us with their crops. Therefore, as the Assembly prepares to recognise hard working farmers come Friday, the University community thought it wise to support you with these items". “Farmers play an important role in the nation’s development so they need not to be underestimated at all. Let us support them to keep on working hard for the development of Mother Ghana.” He said. In his response, the Chairman of the Farmers Day Planning Committee of EMA thanked the management of UEW and promised to ensure that the items are used for the purpose for which it had been brought. 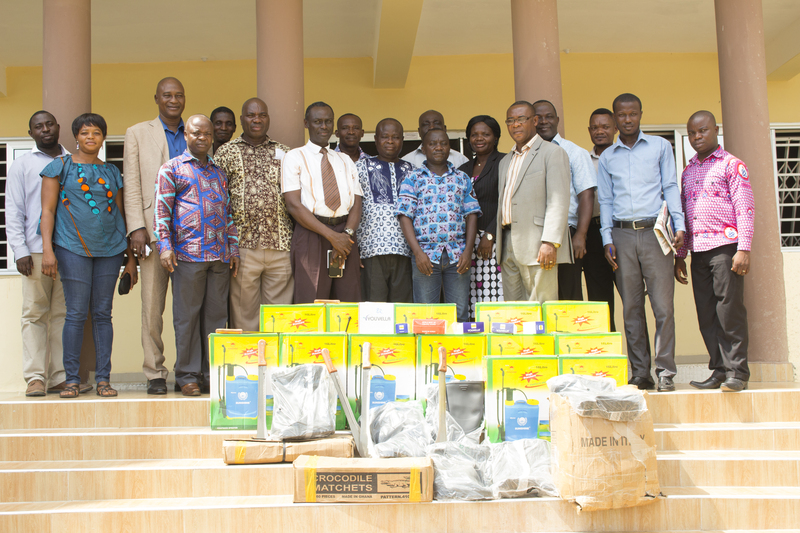 In the team to present the items from the University of Education, Winneba were Mrs. Deborah Afful (Aggrey Hall), Mr. Abeiku Hammond (Division of Operations) and Mr. Emmanuel Kutorglo (Division of Publications and Communication). Friday 1st December, 2017 will mark the 33rd Farmers Day Celebration and the Municipality will mark the day at the Presby School Park in Winneba.